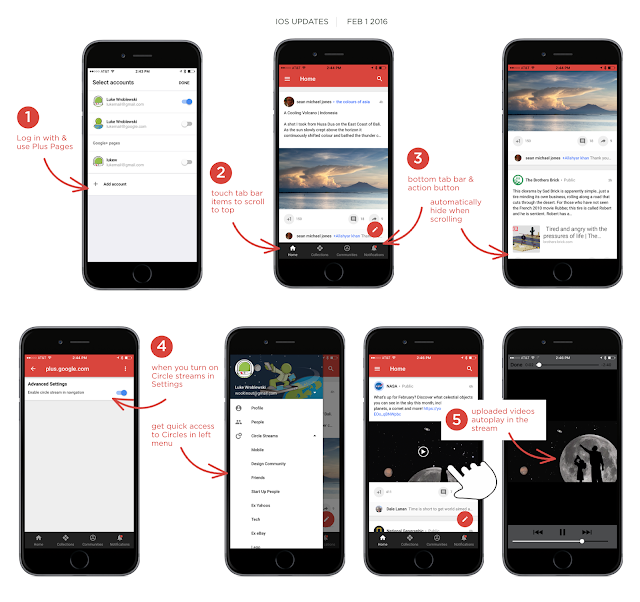 G+ iOS users get some of those goodies that recently made their way to the Android app. Though the Google+ mobile app is available for both Android and iOS devices, it seems like the former gets more of the attention, in turn receiving the most recent updates first. (The same can’t be said of Hangouts, however.) After the Android app got bumped up to v7.1.0 a few weeks ago, those on iOS can now rejoice as this latest 5.2.0 update brings it closer on par with its counterpart. The first thing you’ll probably notice is that the bottom bar now gets out of the way when scrolling, making the overall UI less cluttered and saving on precious screen real estate. Also, tapping the Home button when going through your stream brings you right back to the top, just like on the latest G+ Android version. Before, there was no way to go through a specific stream in the app which meant using the mobile website version to do so. Now, you can now access your circles (aka “Circle Streams”) via the left navigation menu by enabling this in Settings > Advanced Settings. One feature that was introduced in iOS 9 is universal links, where you can directly go to an app on your device after tapping a link instead of Safari. Starting in 5.2.0, the G+ app comes with universal link support, making the transition from the web to the app both seamless and effortless. If you’re stuck on iOS 8 though, you’re gonna have to miss out on this one, unfortunately. Other new features include the ability to log in using a page that you manage, native playback for uploaded videos, and view Collections of people you’re following. And no update is complete without the usual round of bug fixes and the addressing of various accessibility issues. For those whose devices meet the minimum requirements, the 5.2.0 update should’ve made it by now.